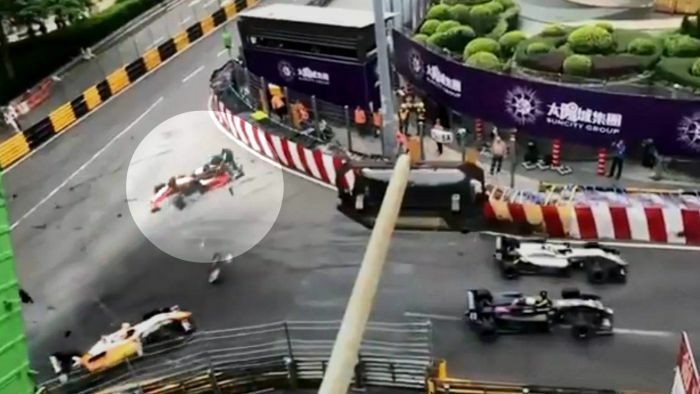 German 17-year-old Formula Three driver Sophia Floersch has sustained a spinal fracture following a huge accident at the Macau Grand Prix. The Van Amersfoort Racing driver lost control into the Lisboa bend before flying over the barriers and into a photographers’ bunker at high speed. Footage on social media showed she was already out of control when her car hit another, sending her flying into the air before hitting the wall. Floersch was admitted to a nearby hospital in a stable condition and is set for surgery. “Just wanted to let everybody know that I am fine but will be going into surgery tomorrow morning,” Floersch wrote on Twitter. Japanese driver Sho Tsuboi, who Floersch crashed into, was taken to hospital with back pain. Race organisers confirmed two photographers and a marshal were also in hospital. The president of the sport’s governing body, the FIA, wished those injured well and promised his organisation would be investigating how the crash happened. “The FIA is mobilised to help those involved and analyse what happened,” Jean Todt said. “We will monitor the situation and make the necessary conclusions. The Mercedes F1 tweeted that she was “one of the family”, while former F1 world champion Jensen Button said he was grateful she was not more badly injured, or worse. Canadian IndyCar racer Robert Wickens also expressed his support online, wishing the teenager a “healthy recovery”.